Flowers for Father’s Day are the perfect way to show your Dad that you care. 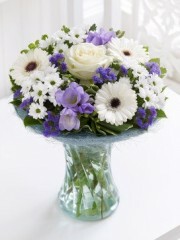 On this special day, Ellon florists provide an array of Father’s Day flowers available to order. Ellon flowers are part of a wider international network of expert florists in over 140 countries. As a result you can place an order for Father’s Day flowers with the florists in Ellon and have them delivered to your loving dad no matter where he may be. The florists at Ellon flower delivery have years and years of floristry experience and are able to use their knowledge to create stunning Father’s Day bouquets. No matter what your preference Ellon flowers can provide something perfect for you. Ellon florists’ online store has a selection of already designed Father’s Day flower bouquets and arrangements for you to choose from. Although Flowers Ellon are sure they will have something online to suit, If you can’t quite find what you are looking for you tell the florists In Ellon what your preferences are and they will create a unique bouquet for you. In addition, if you are unsure of what you wish to include in your Father’s Day flower delivery do not worry. The skilled team here at Ellon flowers have the expertise to design and arrange stunning bespoke flower bouquets perfect for you and your dad. 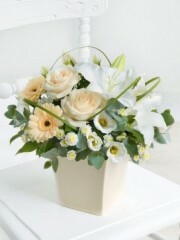 Flowers Ellon use only the finest quality flowers in their arrangements. The beautiful flowers used in their Father’s Day flower deliveries are selected and regularly imported from Holland. The Ellon florists import flowers from Holland on a regular basis as this enables them to ensure the flowers used are of the highest quality and freshness. The flowers available from Ellon Flowers come in a variety of shapes, colours and sizes. There is something to suit all at Ellon flowers. In addition to your Father’s Day flowers, the florists in Ellon have a great supply of gifts that can be included if you want to show your dad just how much he means to you on this special day. If your dad has a sweet tooth there are some delicious chocolates and truffles available as Father’s Day gifts. Furthermore, as part of Father’s Day you can send your dad some fine wine or exquisite champagne. These are only some of the amazing gifts available for Father’s Day from Ellon Flowers. Alternatively, if you feel like your dad would appreciate gifts more than a Father’s day flower arrangement this is not a problem as Ellon florists will be more than happy to deliver the gifts on their own. Flowers Ellon offer a flower delivery service six days a week. You can choose from a range of Ellon flower delivery options that are all affordable. Ellon Flowers offer a fabulous same day flower delivery service, therefore there is no need to worry if you have forgotten to place your order before Father’s Day. The florists in Ellon require you to place your order before 3pm for same day flower delivery. This ensures that they have the time to make sure your Father’s Day flowers order is arranged and completed to the highest standard. Ellon Flowers have a number of experienced delivery drivers who will handle your Father’s Day delivery with great care to ensure your dad receives a gift that will put a smile on his face. If you have any questions do not hesitate to contact the expert florists at Flowers Ellon on 01358 484 089.